Tragedies are always difficult for families to handle. When tragedy struck at Thunder Butte early in the last century, the remoteness of the place and lack of ready access to doctors and medical care made the loss of a loved one all the more poignant. Thomas (Tommie) James Crowley, the son of Thomas Francis Crowley, died tragically in 1926 at about 17 years of age. Gene (John) Crowley, who was only four at the time, remembers the circumstances vividly, and the retelling is difficult. “I remember my mother getting him ready to go to the hospital. Someone had gone for a car. I don’t know who the car belonged to, but it was a Model T Ford without any side curtains. This was in the wintertime. The car probably froze up, had flat tires, etc. I’m sure it was an all day trip to Mobridge…” and the nearest hospital. Today, the trip would be about 80 miles over State Highways 20 and 12, which are paved. Back then, not only would the roads not have been paved, but traveling in winter would have made for very slow going. That night, “the whole family was gathered in the living room.” Cece “…was sitting on my father’s lap.” Cece saw Tommie appear “…at the window and [he] motioned for her to follow him…. She screamed and flew across the room to the window, then ran outside screaming for Tommie.” Of course, Tommie was not there. An important part of the Crowley family's folklore about life at Thunder Butte involves tales of the strange and unexpected things that happened there. A story from one winter's night, sometime during the mid to late-1930's, provides a good example. Gene and one of his brothers were out checking the gate of the property. Some of the family members were away and expected back, but there were about two feet of snow on the ground, making travel across the prairie track virtually impossible. Suddenly, the boys saw two headlights approaching up the snow-covered road. They looked like the headlights seen on a Model T, an old Ford that was common in the country back at that time. They were a bit taken aback because the road was impassable. But, they waited patiently at the gate, expecting that someone-and perhaps their own family members-would need their assistance. As the lights got closer, the boys became uneasy. They could hear no engine, but the silent headlamps kept approaching. Suddenly, as the headlamps neared the gate, they turned and headed out across the open, snow-covered prairie. Again, because of the depth of the snow, this was an impossibility. The boys stood by the gate and watched as the lights slowly receded into the distance and eventually disappeared down a draw. The next morning, still thinking that someone must have been out driving in the snow and in need of help, the boys went out searching for the tracks. They found none on the road or where the lights had veered off into open country. No car had traveled that road the night before. To this day, there is no explanation for the ghost lights seen near Thunder Butte that night. Thomas Crowley and his family arrived at Thunder Butte in 1913 without a great deal of money. Timber was scarce on the prairie and would have been costly to obtain in the nearest towns of Dupree or Faith. With few options other than living in an improvised tent, Thomas did what most other newcomers to the prairie did. He built a sod house for his family. A "soddie" was typically constructed by cutting two foot long slabs of sod from the ground--a foot wide and four inches thick. The slabs were stacked to create two-foot wide walls. Branches or timbers would have been laid across the top of the walls with slabs of sod placed atop these to create a roof. Although a rudimentary dwelling by our standards today, sod houses provided a great deal of insulation against the heat of summer and the biting cold of winter. By all accounts, Thomas' wife, Mary Patricia--also known as Mayme, did not like the life of hardship at Thunder Butte. Living in a sod house, miles from the nearest neighbor, with only the butte, the prairie grass, and the rattlesnakes for company, she must have wondered why she had ever agreed to settle in this country with her husband. Secretly, she harbored a feeling that only a fool would have given up the security of Wisconsin and family to come to a land like this. Adding to her fear for her family's well being was that the homestead was surrounded by tribal areas. She didn't really understand what the Indians were doing here, why the Indians crossed the property, and congregated about the butte. Of course, the Indians knew little of dry land farming themselves and lived in deep poverty following the forced abandonment of their nomadic, hunting ways. They often came to the door begging for food. And, sometimes they would take things. To them, this was their land and the whites were interlopers anyway. 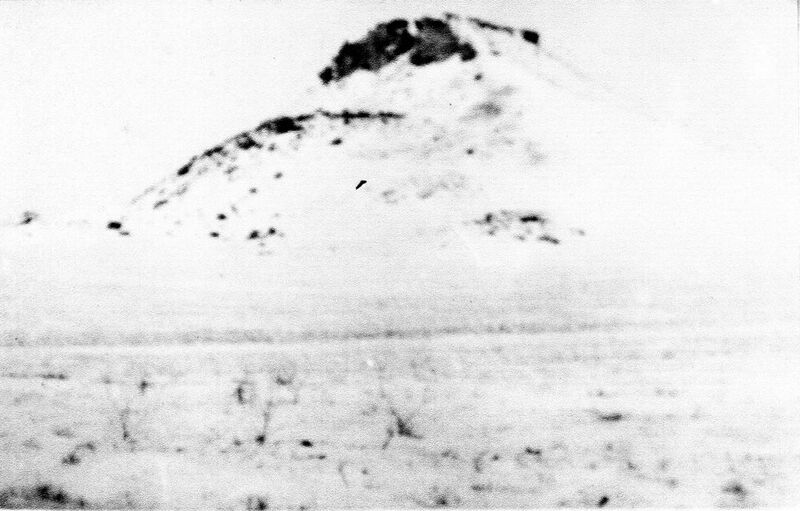 Mayme did not know the religious and cultural significance of Thunder Butte to the Lakota. Even if she had understood as much, she likely would have viewed them as heathens. Often, Thomas was away from the place, working to bring home food or little things to improve their lives. Sometimes, he and the boys rode into Faith to get provisions. At times such as these, when Indians came to her door, Mayme grabbed a gun. She said as much, years later in California--not long before she died.